Buy SOLITUDE RAVENCROW a Coffee. ko-fi.com/solituderavencrow - Ko-fi ❤️ Where creators get paid by fans, with a 'Buy Me a Coffee' button. 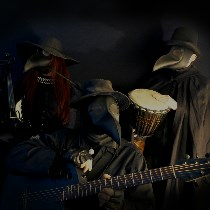 We are SOLITUDE RAVENCROW an apocalyptic folk band from Germany. Our music is shaped by spiritual and occult influences. Our acoustic tracks and dark-ambient tracks often sound psychic and depressive. So, take a good coffee and come with us on a hike between the worlds. Secured Payments. Support goes to SOLITUDE RAVENCROW's account. Upgrade SOLITUDE RAVENCROW to a yearly Gold Membership with a one-time payment.